Doyle Brunson is the undisputed king of poker and still going strong at the age of 75. In this article I will give an overview on how Doyle “Texas Dolly” Brunson built his poker bankroll. Doyle Brunson was born in Longworth, Fisher County, Texas on August 10th 1933 as one of 3 children. In his younger years Texas Dolly was a talented athlete and basketball player until an accident during a summer job broke his leg in two places and put an end to his athletic aspirations. Back in the days when Brunson started to build his poker bankroll, poker was illegal and usually run by members of organized crime groups. On several occasions Doyle had guns drawn at him and he was also beaten and robbed. Gives the term “bad beat” a whole new perspective huh? Brunson first started playing the illegal games on Exchange Street in Fort Worth, Texas together with his mate Dwayne Hamilton. As Doyle Brunson’s poker bankroll grew the two man group teamed up with poker legends Amarillo Slim and Sailor Roberts. As the story usually goes, the group of Texas Rounders built a huge bankroll by the standards in those days, and them hit Las Vegas only to loose everything. The group was dissolved but Doyle Brunson decided to stay in Vegas….a legend was born. Doyle Bruson’s poker bankroll has grown considerably from his live tournament winnings which exceed 5.9 million $. Brunson was the first player to reach 1 million $ in tournament winnings and through his career he has won 10 WSOP bracelets. He has recently published Super System 2 (2004), a follow up on his first book. 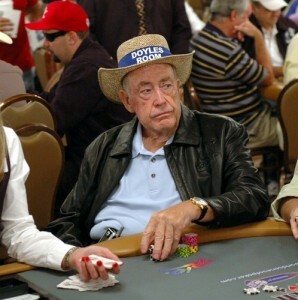 Doyle Brunson is also a spokesperson and endorser of the online poker room DoylesRoom. Brunson’s nickname Texas Dolly comes from a particular incident where the American Sports commentator and bookie Jimmy Snyder by mistake introduced Doyle as Texas Dolly instead of Texas Doyle. A “Doyle Brunson” is a 10-2 off suit or suited starting hand in Texas Holdem. The names comes from the fact that Texas Dolly won the WSOP with this hand – twice! Brunson has been around for so long that he has seen three men die at the table. One was shot point-blank in the head (ouch!! ), and the other two died of heart attacks, one of them apparently from the shock of losing a huge pot to the Texas Dolly. In the early 60s, Brunson was diagnosed with “incurable” cancer after a tumor was found on his neck. After a risky operation the cancer disappeared without a trace. Doctors call his recovery a miracle. Some of Texas Dolly’s most famous quotes are “That’s poker folks” and “You don’t stop playing because you get old, you get old because you stop playing”.